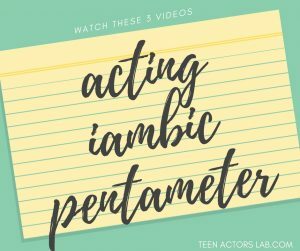 If you want to learn how to act Shakespeare like a pro (after you watch my three videos on iambic pentameter) you are going to fall in love with this incredible series from the 80s, Playing Shakespeare. Maybe you have college auditions coming up and you know you are going to have to act a Shakespeare monologue or maybe a local theatre is about to do a production of “A Midsummer Night’s Dream” and you are dying to play Helena. Either way, having some tools to help you rehearse is going to be a game changer. Sure, it’s totally dated and you can definitely tell by the actors’ hair, which makes it even more fun to watch in my opinion. This series for actors is going to blow you away and it’s here on YouTube totally free. I have embedded the entire playlist above for you to watch. Best free acting lesson ever: Expect the opposite	What if your parents don’t support you?